I am a 24 year old student living in Dublin, Ireland. I love to look good and unique, yet very Islamic! I try to show people that you can be well covered while wearing your cultural attire with hijab. I love to match my hijabs to the colour of the clothing I am wearing. My favourites are olive, blue, brown and gold. My favourite items of clothing will have to be abayas and dresses. I don't know exactly why, but I feel and look good in them! In the top right photo, I am wearing a traditional Nigerian fabric called "Adire". It was custom made for me by a dress maker in Nigeria. I bought the hijab to match the outfit at Upton Park Market. I tend not to stick to one style - it all depends on my mood, the event I am attending and Nigerian culture. I'd say my style is very simple, elegant, classy and chic. Always have a nice hair do underneath your hijab, it always shows on the face! you look absolutely fabulous mashaalah. im so inspired by your look. your well covered but extremely cool. i love the colours i am so going to try that! im 24 too but sometimes i feel so old because of the way i dress, maybe i just wear too many dark clothes im going to try and change it! but btw, i think the best is the pic of you in the black and brown, i love that sash/belt across the middle it looks really good mashaalah. id love to know where you got that from. I like the top blue picture & the brown picture best. I can`t wait to see more contributions! Shes lovely. She has a lovely smile and the fact she observes hijab properly is beautiful! I LOVE her style Mashallah! She looks especially beautiful in that blue traditional outfit, the bright blue one. 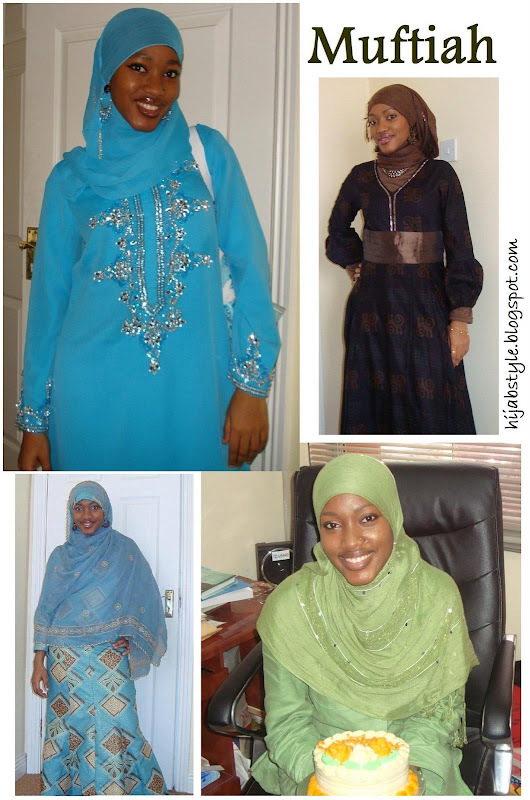 I like the way Muftiah styles her hijab; love the 3rd elbow length one. Wow! Wonder if that Nigerian dressmaker has a web site! The fabric is fantastic masha'Allah! I think she looks STUNNING! I love them all, especially the 1st one...that is one of my favorite colors.Beautiful! Wow, masha'Allah... I really like the top right one too! It's so cute, mA. She has a nice style! Mashallah, she is so pretty! I love her style of dress. mashaAllah, absolutely gorgeous... I loves green hijab!!! MashAllah she is so beautiful, and I love her style. I LOVE this one! the two top ones have got to be my favorite...I love that vibrant blue, and the traditional Nigerian one is so elegant. The Nigerian dress is stunning MashAllah. The fabric is beautiful - any idea if you can buy 'Adire' in the UK? Thanks everyone! I do appreciate the comments!awwww...ya'll are sooo sweet & cute! just like my smile..lol. The Fabric can be bought in the UK, Liverpool street is a good place to go!. It should cost btwn £15-£30, nothing more..! Mashallah, the sister looks gorgeous! I love her look!